The Campo Fire and Rescue Communications Auxiliary is composed of local Federal Communications Commission (FCC) Licensed Amateur Radio Operators (Hams). Using their home and private vehicle equipped ham radios and staffing the departments Emergency Operations Center (EOC) during emergencies, the Communications Auxiliary provides primary communications to the community and backup communications for local public service agencies. 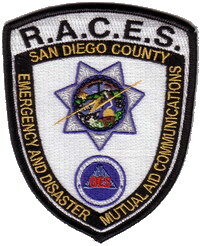 Various members of the team are trained and attached to, The San Diego Sheriff through the Radio Amateur Civil Emergency Service (RACES) Team, The American Red Cross , and the San Diego County Office of Emergency Services. The Community Emergency Operations Center (EOC) is located in the Campo Fire and Rescue Station 46 in downtown Campo California. This communications center is the focal point for community emergency and disaster communications and support in the Campo / Lake Morena area and, if required, anywhere in East San Diego County. 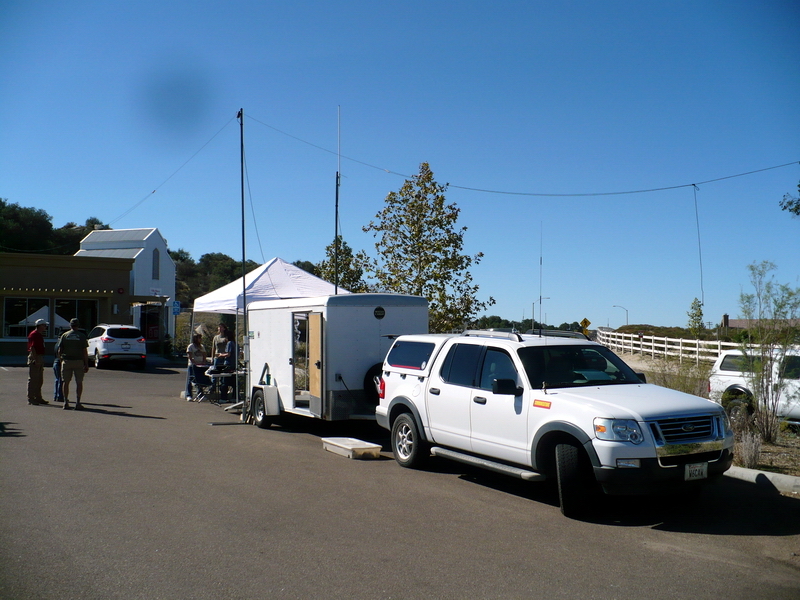 Manned by local Amateur Radio Operators and CERT Team Members, the Center currently has the ability to communicate within and outside of the area on the Amateur Radio 160,80, 40 and 20 Meter HF Bands, and the 144 MHz, 220 MHz and 440 MHz Amateur bands. Additionally the San Diego County Office of Emergency Services (OES) has provided us with Regional Communications System (RCS) 800 MHz public service radios. 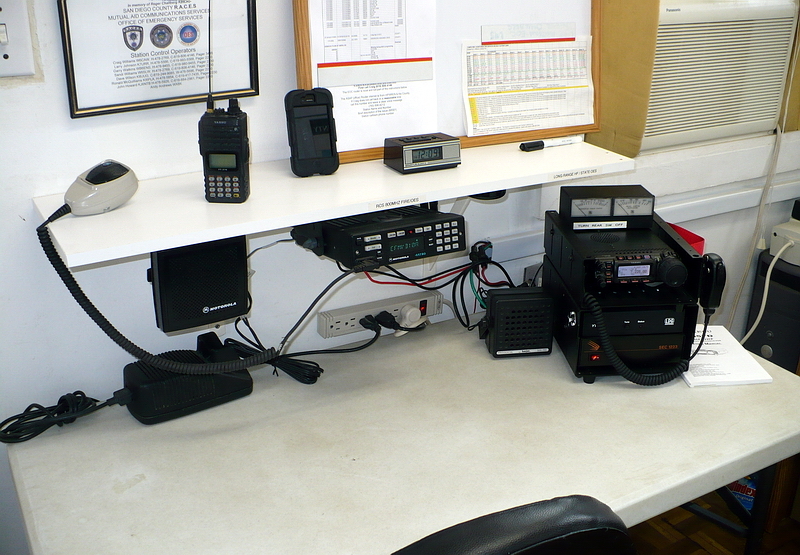 The Center also has portable radios capable of communications on the Family Service Radio (FRS) and "Red Dot" VHF frequencies. A computer and printer provides Topo mapping information to coordinate our responses, Internet access to the World Wide Web, and the San Diego County Emergency Operations Center WebEOC. Internet access is provided by the Departments wireless high speed Internet systems ( primary and backup networks ). The entire room and all equipment can be powered by 12 volt gel cell batteries totaling 400 amp hours and the departments 30 kW automatic backup generator. Operating position #1. Left to right. 800 MHz Public Service base station. ( All Public Service agencies in San Diego County and Imperial County use the RCS Motorola trunking system for their primary communications.) Our Yaesu FT-857 Amateur HF Transceiver, SWR/Power meter, and LDG tuner. 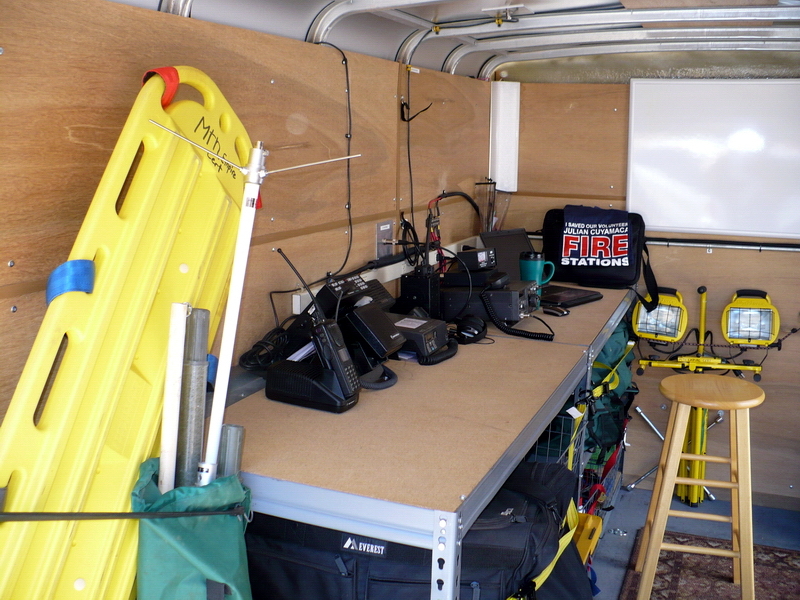 Mounted in a portable case the HF system can be quickly moved into our communications trailer. The Yaesu is connected to an inverted V dipole for the 160,80, 40 and 20 Meter bands, see below. If you are a HAM or short wave listener listen for us on Monday nights, 8 PM local time, on 3.960 MHz. This frequency is the Amateur Radio statewide emergency communications NET. Monday evenings all the California County EOC's check in with the State Office of Emergency Services EOC in Sacramento. Operating position #2. Left to right. Corner shelf, manuals for all radios and radiation detectors. Computer system with wireless 802.11 router connected to the community wireless internet. Radio shelf above the desk. Phone / FAX Modem lines. Kenwood VHF fire radio, portable scanner and base scanner. Mounted under shelf. Amateur 450 MHz, Amateur 144 MHz and 220 MHz radios. Behind the desk is an Anderson Power Pole, DC distribution panel powered by 4ea, 200AH gel cells in series/parallel, charged by a Lambda 65 Amp switching Power Supply. 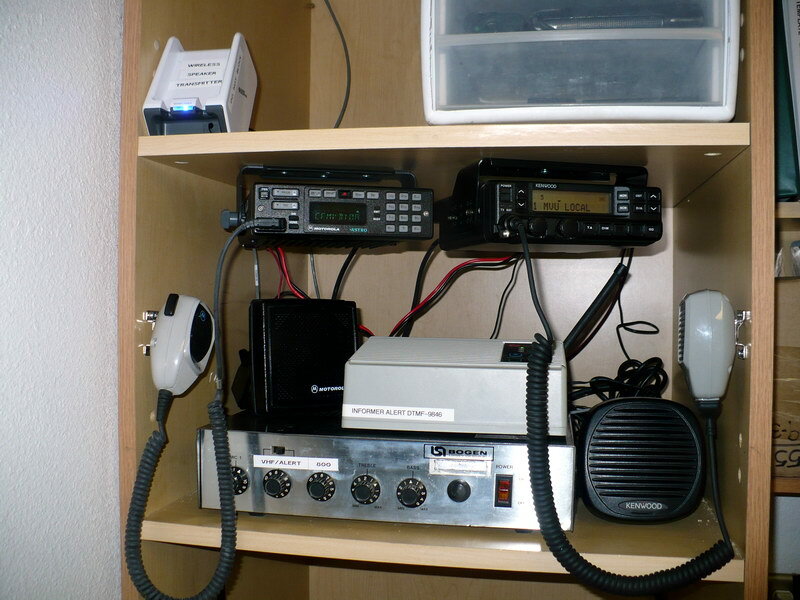 Additionally we have a cache of Amateur VHF/220/440 portables and Kenwood VHF fire portables. This station is operated by our Communications Auxiliary during emergencies and exercises as a point of contact for the community. The trailer was purchased through our CERT Program. With a grant from San Diego Gas and Electric ( SEMPRA Energy ) we equipped it with shelving, DC power/battery distribution, and a 2 kW sine wave generator. 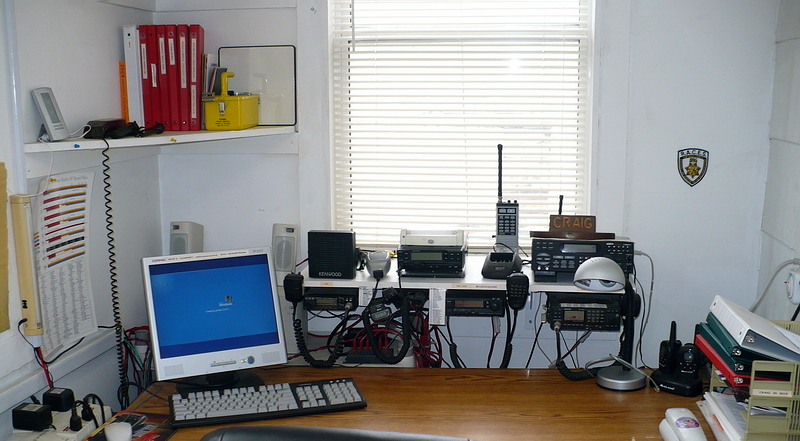 The SDG&E grant also allowed us to buy the Yaesu FT-857 HF radio and a number of portable Ham radios. Here the trailer is shown setup at our local Cafe "B" restaurant for the local ARES Ham field demonstration day held in October of 2013. Antennas are supported with the surplus fiber glass "camo" poles you see all over the internet and at swap meets. The longwire is an 80 Meter OCF. 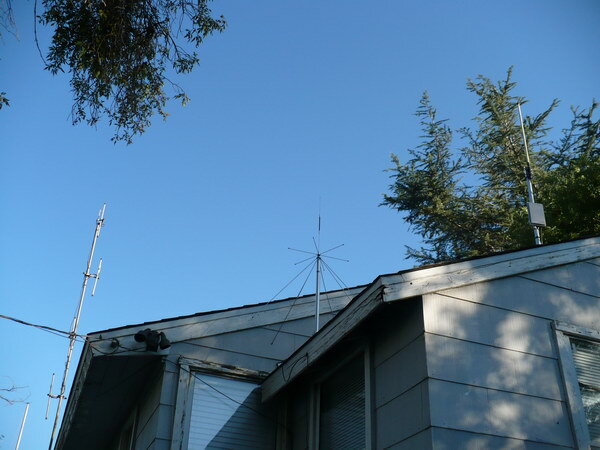 The vertical is a Comet VHF/UHF. Another inside shot. The trailer is equipped with some basic response equipment. Being a Fire Agency we can always grab more "stuff" to throw in the trailer depending on the need at the time. 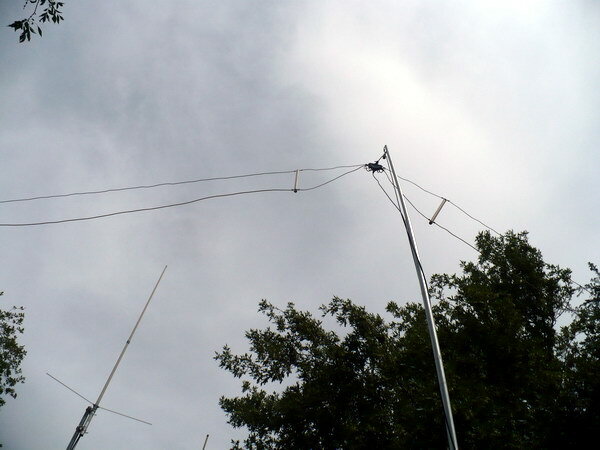 Our HF antenna is a modified Alpha Delta DXCC. The top wire is the stock DXCC for 160/80/40. 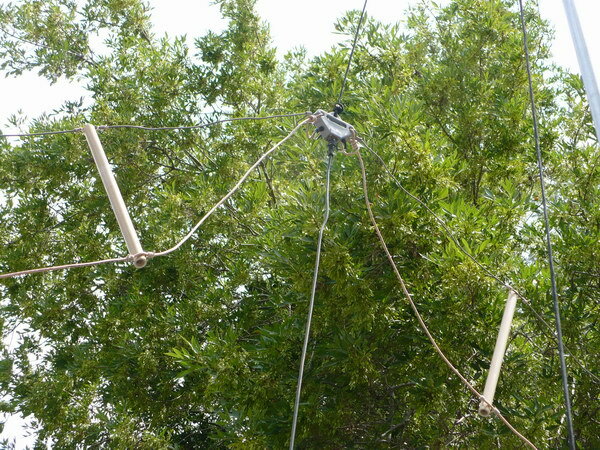 The bottom wire is our home brew 20M dipole addition made from 12 gage house wire!. To the left our Comet 2M/70Cm antenna. Close up of the DXCC modified HF antenna. The spreaders to hang the 20M wire on are made from 1/2" PVC pipe. A pulley mounted to the top of the center mast allows us to pull the antenna up and down for tuning. If I want to put it in the classic NVIS, closer to the ground, all I have to do is lower it to 1/2 staff. 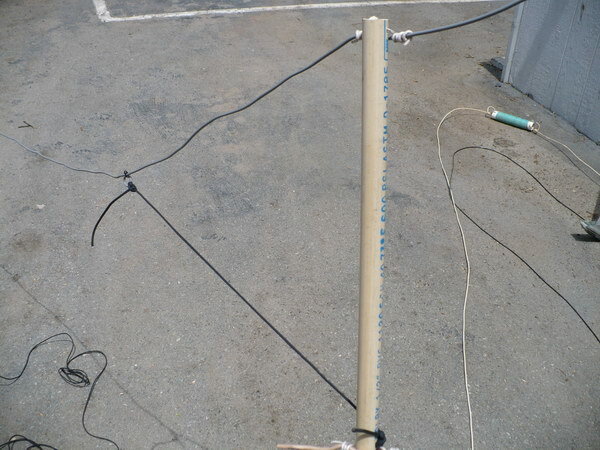 View of the end spreader to separate the 20M wire and the stock DXCC wire, there are 3 of them. I used dacron line to keep the 20M wire tight. You can see one of the DXCC loading coils laying in the background. No wait, that's my home brew coil from the previous antenna. Which is my point, when I bought this DXCC several years ago and noted it was made from PVC pipe, house wire and magnet wire I said, I can make that, and have done so since. Holding up the center pole and one end is accomplished by dropping them in a fence pole. As in my home QTH Carolina Windom, the support poles are whatever fit together from the local hardware store to get the height I wanted. The center is about 30 feet, the ends around 20. Sort of an inverted V? For the other end, I found this nifty bracket in a pile of dirt under the fence. 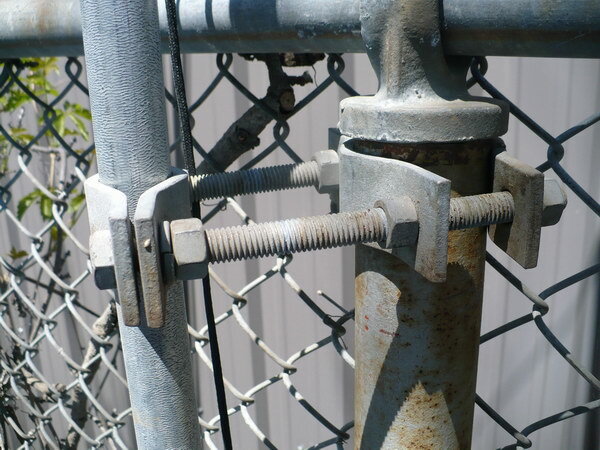 I haven't the faintest idea what it is normally used for but a pair of them mount an antenna mast to a chain link fence like they were designed for the application! Left to right. The department VHF antenna. 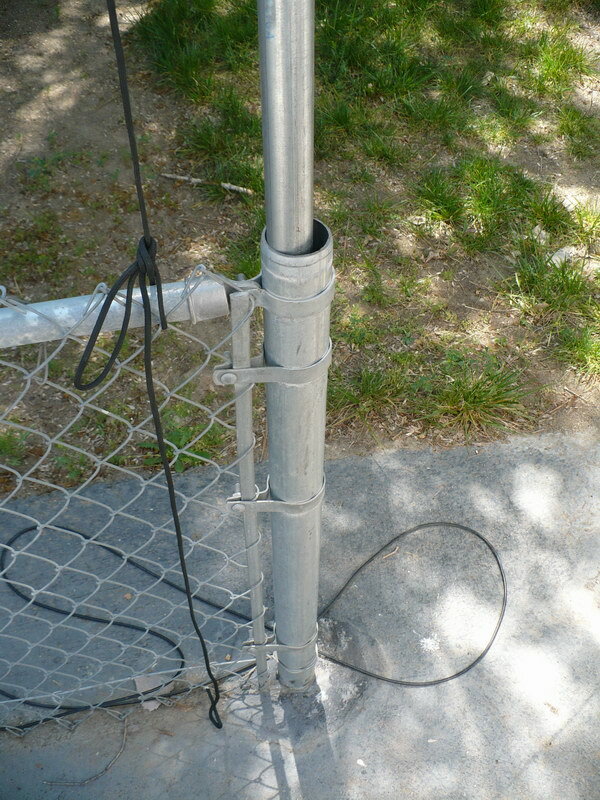 Ham 220 antenna, Multi purpose discone. Department 800 MHz public service radio antenna with 800 MHz, wireless Internet subscriber unit mounted below. Our Comet 2M/70Cm antenna is to the far right out of the photo. In February of 2011 we re-modeled the firehouse and moved the department radios and antennas towards the front of the house. Above the new Campo Fire Department radio setup. Top shelf is the wireless speaker system transmitter connected to the PA system. Operating on 900 MHz it sends PA/radio signals to 4 speakers located throughout the firehouse. 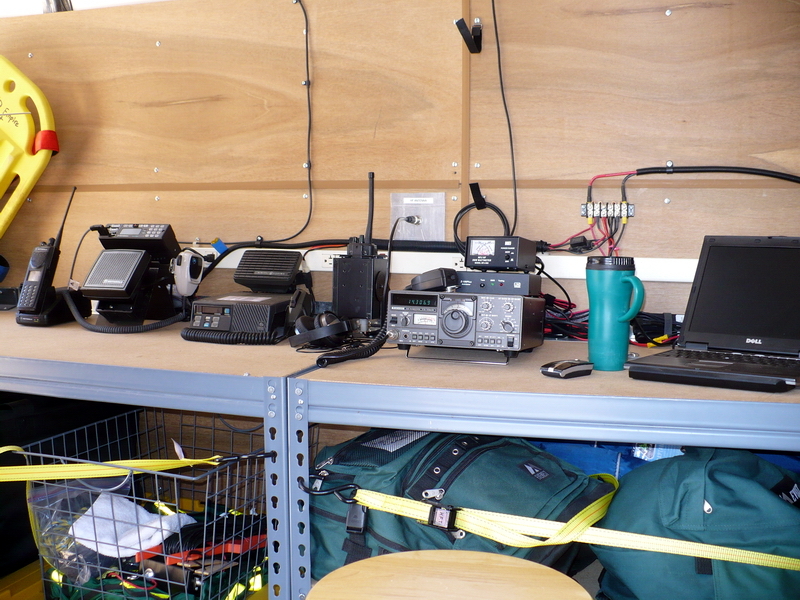 Our radios below are a RCS Motorola 800 and a Kenwood VHF. In our area the RCS is used mostly for all activity except wildland fires and communications with other agencies. The RCS system covers most all public service agencies in San Diego and Imperial Counties. The VHF system is the primary radio for wildland fires and working with Cal Fire and Federal fire agencies. 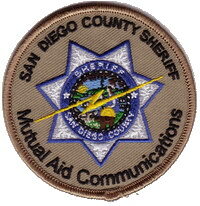 Most of the rural areas in San Diego County are dispatched on VHF by the Cal Fire Emergency Communications Center (ECC). VHF frequencies are coordinated countrywide and statewide. Sitting on top of the PA amp is a Federal Systems alert monitor. In San Diego each fire station is assigned a 4 digit DTMF tone. When dispatch sends out the tone for your station the Federal wakes up with a warble tone to let you know a call is coming. The output of the Federal and 2 radios are routed to the PA system and broadcast throughout the firehouse. See www.campofire.org for more on our fire department. Friend to everyone he knew. Resting in peace January 5, 2011.